I love a good sandwich. Growing up, my dad was a master sandwich maker. All he had to do was ask and I was game. I’d watch as he toasted bread and layered meat with cheese, tomato and lettuce, and his spread of choice. Sometimes they were open face sandwiches, slipped under the broiler for a little melty goodness. Other times, they were on English muffins, which remains one of my favorite building blocks for sandwiches to this day. Always, they were delicious. My dad–the sandwich man. These days, while I’m still a sandwich fan, it’s easy for familiar combinations to become old and tired quickly. I mean really, I eat a sandwich most days of the week for lunch? How many different ways can you make a sandwich? When ennui sets in, it’s time to shake things up a bit and think outside the box. Take the tried and true original pieces and swap them out for something a little more exciting. And that, my friends, is where this wrap comes in. Yes, a wrap is a sandwich in a rolled-up form. And by selecting a flavored tortilla for my base–in this case, sun-dried tomato–we’re already breaking a case of the blahs. The chicken is a stand-by, for sure, but the roasted tomatoes give it a bit of oomph. Store-bought tomatoes taste so bland this time of year anyway–roasting gives them a flavor boost that is addictive. Then some chopped olives for a little bit of brininess and cheese, of course–have to have the cheese–and you have yourself a sandwich. Almost. Once you’ve assembled all your filling components, you have a tough decision to make. The piece-de-resistance comes next–the spread, the dressing, the mortar that holds it all together. And after you’ve put so much work into your masterpiece, you don’t want to waste your efforts on something boring. Go for something a little different, a lot of tasty, and easy to procure. You want Hidden Valley® Cracked Peppercorn Ranch. 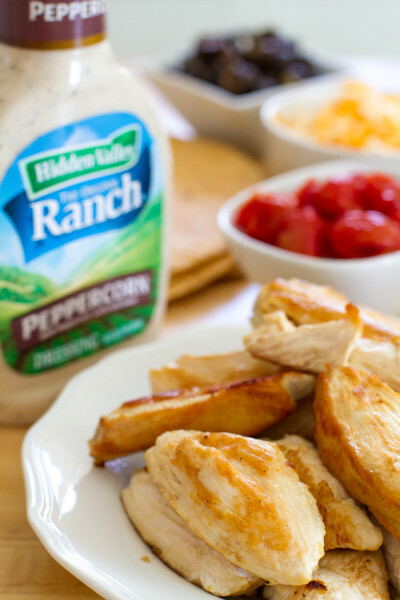 Hidden Valley® Cracked Peppercorn Ranch is transformative, with its zesty twist on the Ranch you already love. Peppercorn, garlic, and onion give it a nice little bite that makes you want to take bite after bite after bite. It’s addictive. Soon, you’ll be pouring it on everything. I highly recommend French fries. In the meantime, let it use its powers to bring your sandwiches to new heights of enjoyment. You’ll wonder how you ever got by without it before. In a cast iron skillet heat ½ Tablespoon (1½ teaspoons) EVOO over medium high heat. Sprinkle salt over the chicken and cook, flipping once halfway through the cooking time, til there’s no pink left and cooked all the way through (you may have to cook it in 2 batches, in which case you’d use half the salt for each batch). This should take 5-7 minutes per batch. Set aside. In an 8×8 baking dish, spread out the cherry tomatoes and toss in the other ½ Tablespoon EVOO. Put in a cold oven, set temperature to 400 degrees Fahrenheit, and bake for 20 minutes, stirring periodically. Drain and set aside. Divide the lettuce into 4 portions and lay out a line of it in the middle of each wrap. Over the lettuce, place 4 or so chicken breast strips (about 4 ounces of chicken for each wrap). Sprinkle ¼ of the olives over each wrap. Spread out ¼ of the roasted cherry tomatoes over each wrap. 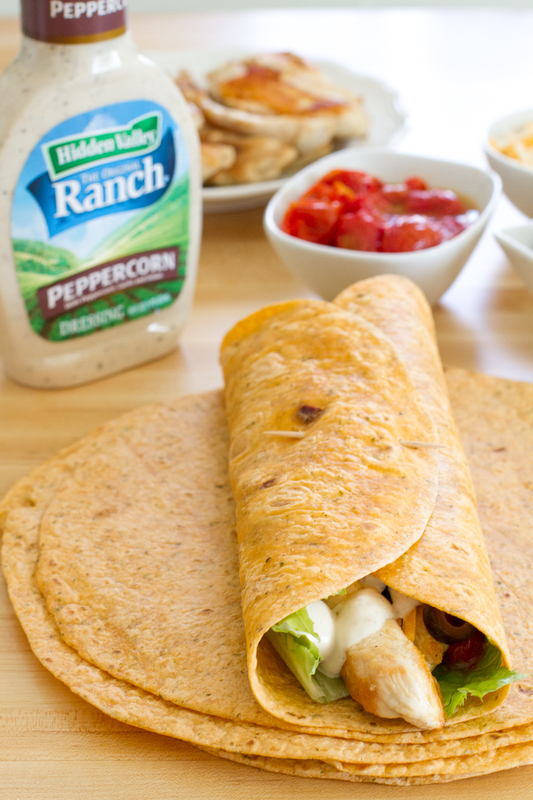 Sprinkle ¼ of shredded cheese over each wrap. 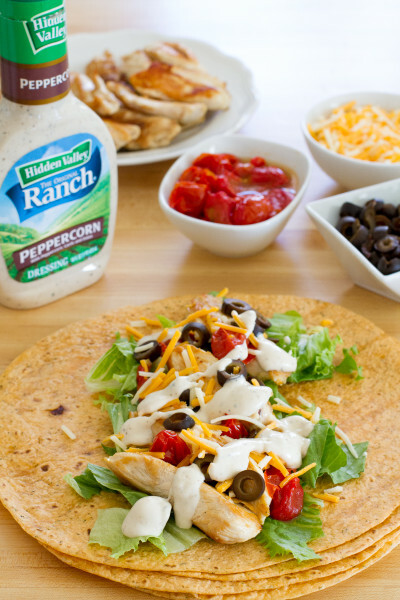 Drizzle 2 Tablespoons of Hidden Valley® Cracked Peppercorn Ranch over each wrap. Fold over the flaps (left over center, right over center) and secure with toothpicks. Eat right away or wrap with plastic wrap and bring to work for lunch. You can use leftover or pre-cooked chicken, as well. 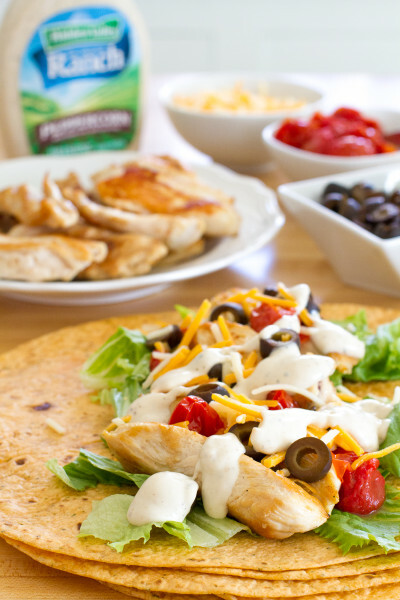 The wraps taste just as good with cold chicken. Ranch dressing makes the world a MUCH better place! 🙂 These wraps look delicious!